As in nature, the composting process requires raw materials. They constitute the substrate for the end product. However, the quality of these materials can differ substantially. The quality differs not only between suppliers; every consignment can also be different. 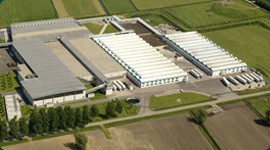 Hooymans Compost B.V. therefore applies strict criteria in this regard and selects its suppliers itself. Only the best quality raw materials produce the high-quality compost we are proud of.